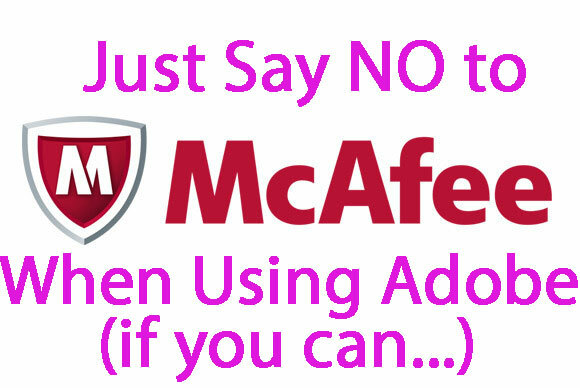 Adobe Reader – used by so many computer owners – now does not even ASK before downloading McAfee Security Scan Plus in tandem with the Reader download. That is an underhanded practice. At Danville Computer Doc, we despise sneaky “no options” downloads. That is called malware. And when it’s a piece of “you know what” like McAfee — that we never EVER recommend for any client. Yes, it’s that bad — as you can imagine since they now have to swindle unsuspecting users to download their junk. In addition, Adobe Reader takes the liberty (again without asking) of changing your “default program” for PDFs to itself. What a royal pain! So, if you want a better way to do PDFs — try Foxit Reader. It’s what we use. It’s faster, it’s lighter-weight, and it doesn’t come with piggy-backing, unwelcome programs — nor does it assume that it’s the only game in town and change your preferred program without asking. Also be warned that this is automatically checked on Adobe Flash installs. So be careful to uncheck it when installing Flash too. If you have any questions about this, call us. 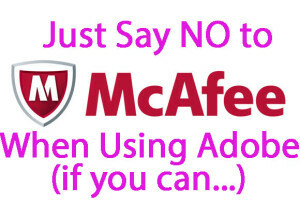 If you want a recommendation for good virus protection (hint: It’s NOT McAfee), call us. 859-755-4344..
← How Much Do You Want to Share?